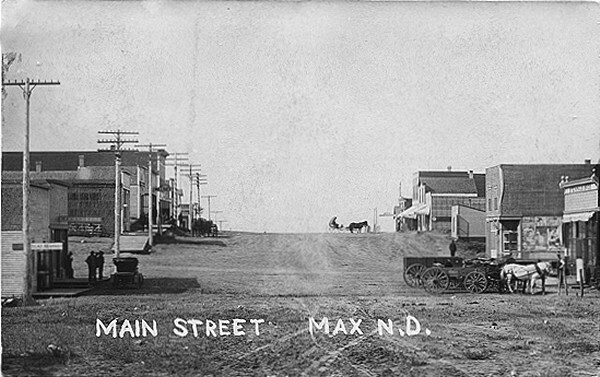 Max in fall 1907. From "Golden Jubilee 1906-1956." Before 1906, rumors were circulating that the Soo Line of the railroad would lay track close to Elbow Lake, north of the town of Garrison, to obtain water for their steam engines. On this prospect, enterprising businessmen began staking claims in anticipation of purchasing prime real estate in a new town. 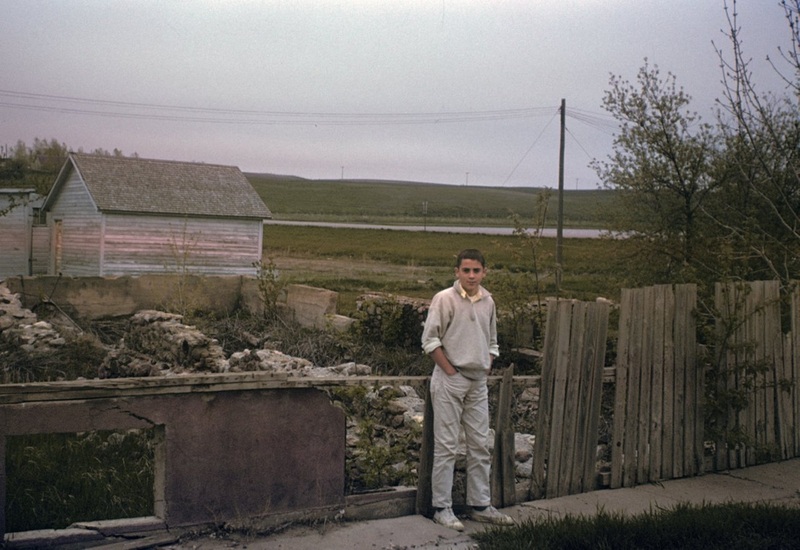 A haphazard shack-building boom ensued on the surrounding ambling prairies. On August 8, 1906, a surveyor named J.G. Sheldrick filed a certificate to plat what would become the Max townsite on a grid in McLean County. The Soo Line came from the south and would have east and west branches at a junction to be named "Junction" or "Junction City". However, people started calling it Max's Post Office, after Max Freitag, eldest son of Paul Freitag. Paul Freitag was a local farmer and the first postmaster. Young Max asked people he met at the farm post office if they were coming to "his" post office to pick up their mail. The name, truncated to simply Max, stuck (in habit, if not officially). 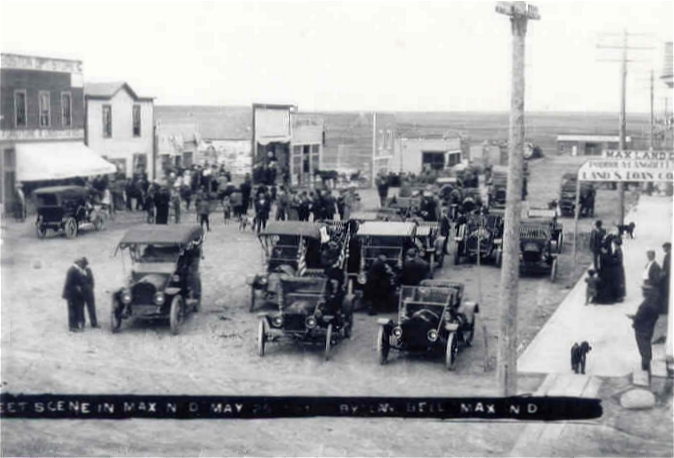 In 1906 the town was moved two miles west to the present townsite, where the railroad junction was actually located. The name was changed officially to Max. 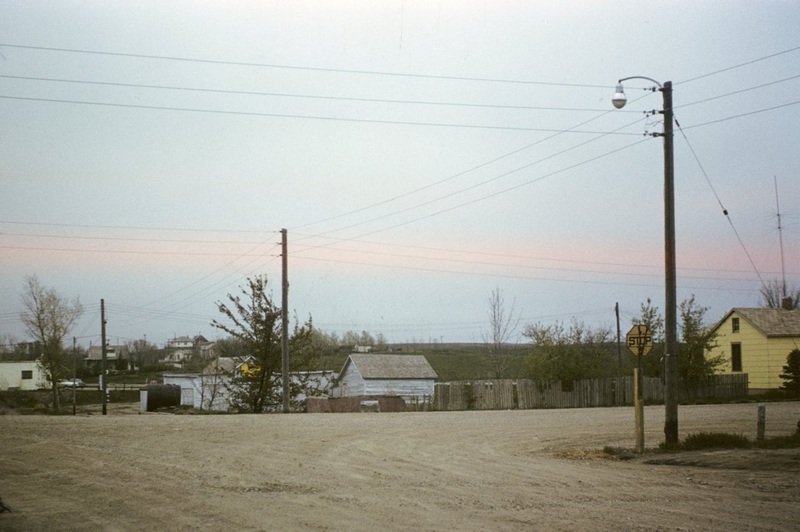 The town is located on Highway 83, which runs north to Minot and south to Bismarck. Oldest photo of Steinhaus Bros store. 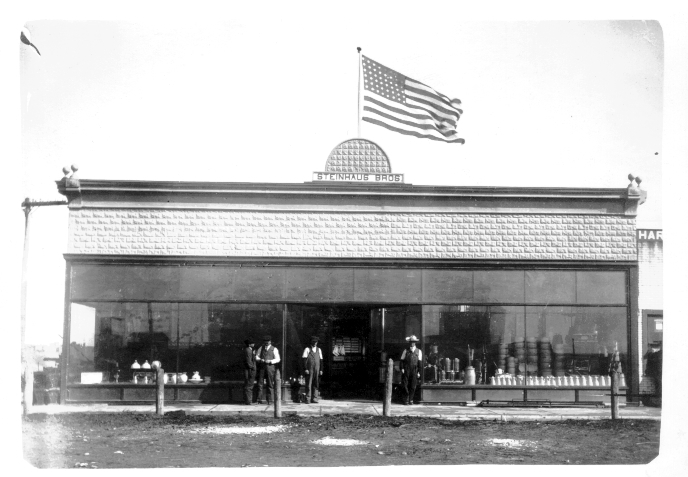 This was the first store to be built in Max, 1906, by Art and Gust Steinhaus. This store blew down in 1907 and was rebuilt. Interior of original Steinhaus Bros store. 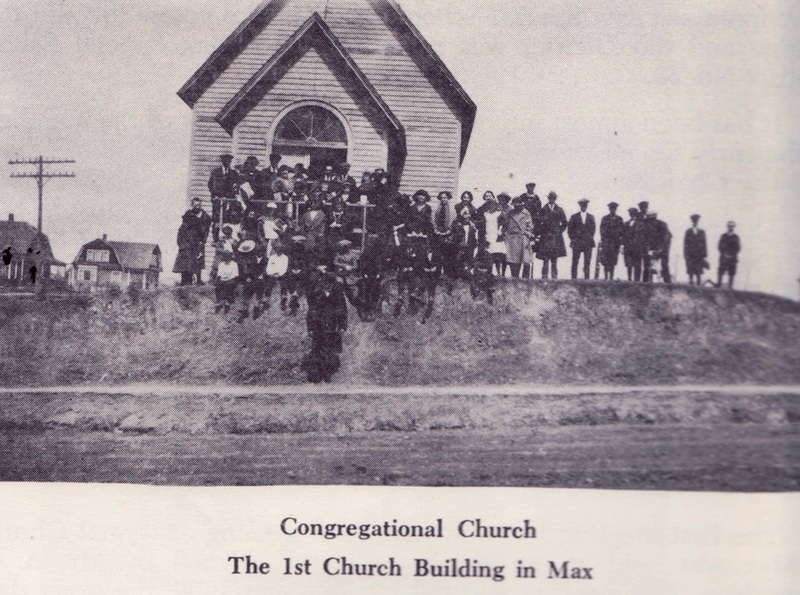 This photo taken about 1906. Steinhaus Bros general store, about 1907. This is the rebuilt store. Art and later his family lived in a room of the store until 1921. His two oldest sons, Edward and Ralph, were born in the store. Gust lived on a farm just out of town. Max baseball team in 1908. Art Steinhaus in white shirt was the team manager. 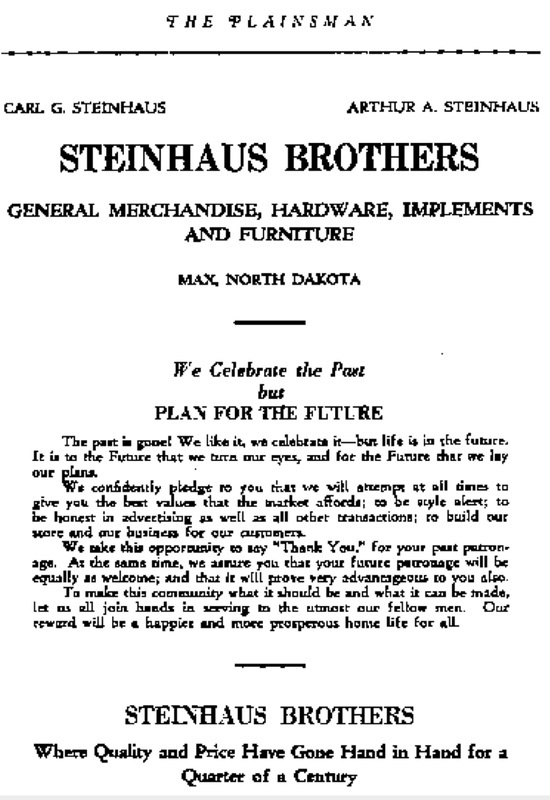 The Steinhaus Bros store was expanded in 1913 with a full plate-glass front and largest full basement in town, according to Jim Steinhaus. 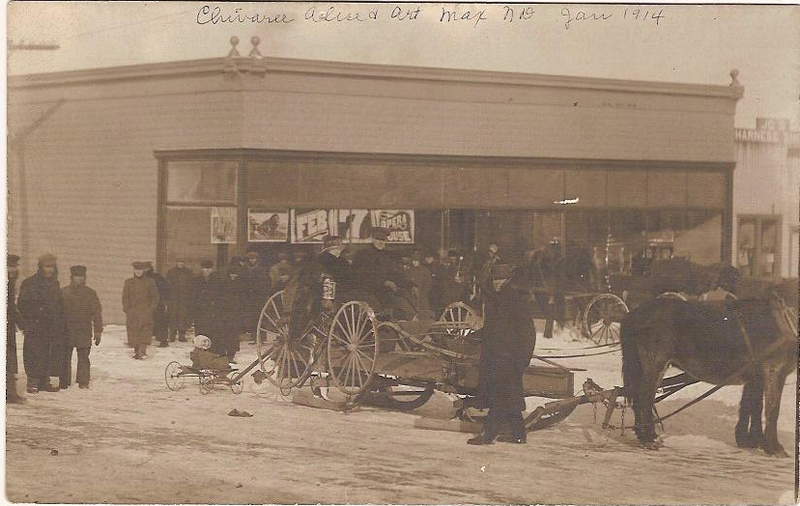 Alice and Art Steinhaus wedding chivaree in January 1914, in front of Steinhaus Bros store. 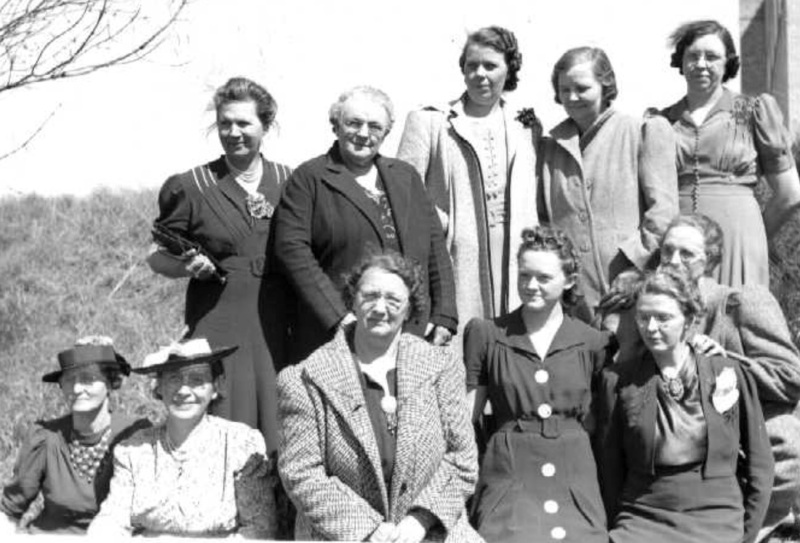 Alice Steinhaus (second from left in front row) helped establish a study group in Max, called Salus Athena. This photo taken in 1943. 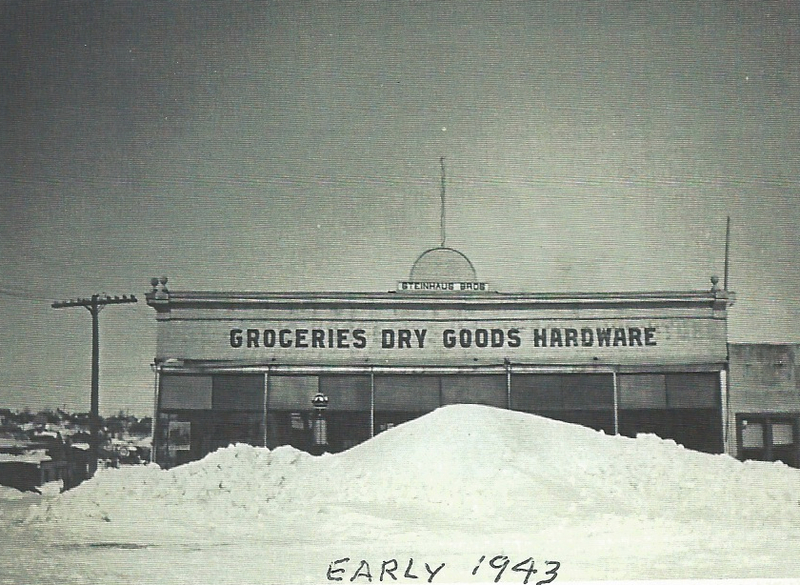 The store was sold in 1946 and burned down in 1949. 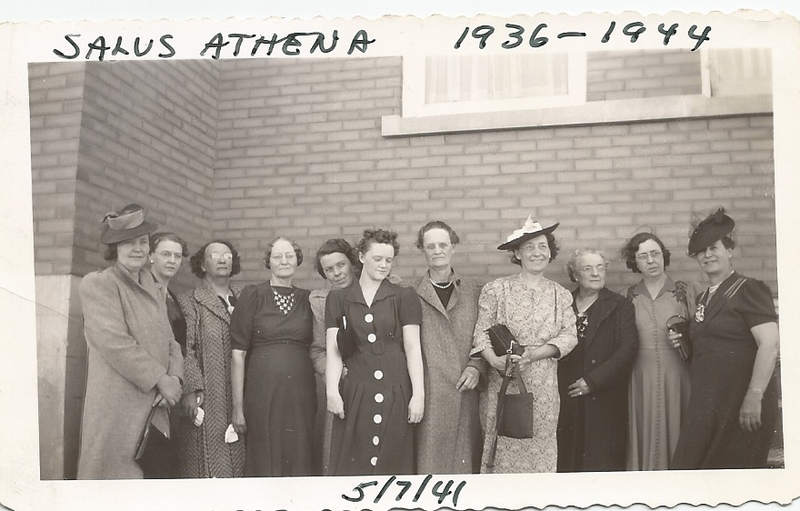 Another photo of Salus Athena, with information written on photo by Alice Steinhaus. These photos may have been taken on the same day as they are wearing the same clothes. 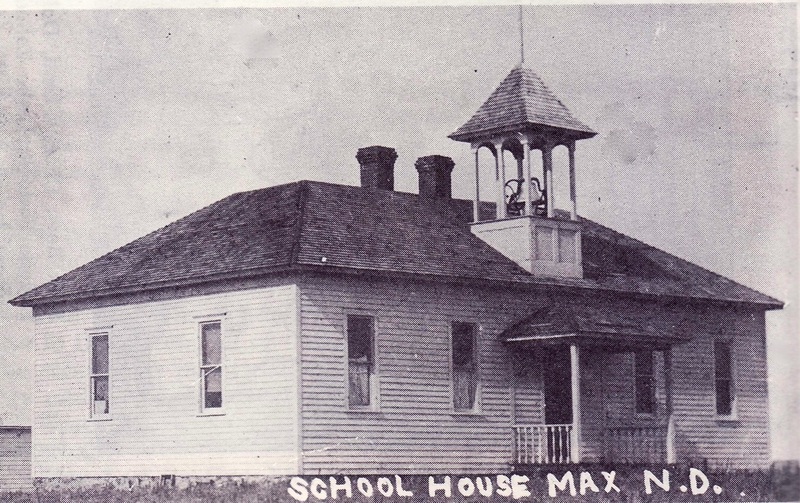 The new Max School was built in 1929, according to Jim Steinhaus who took photo on right in 1978. It had all grades, (no kindergarden in Max). 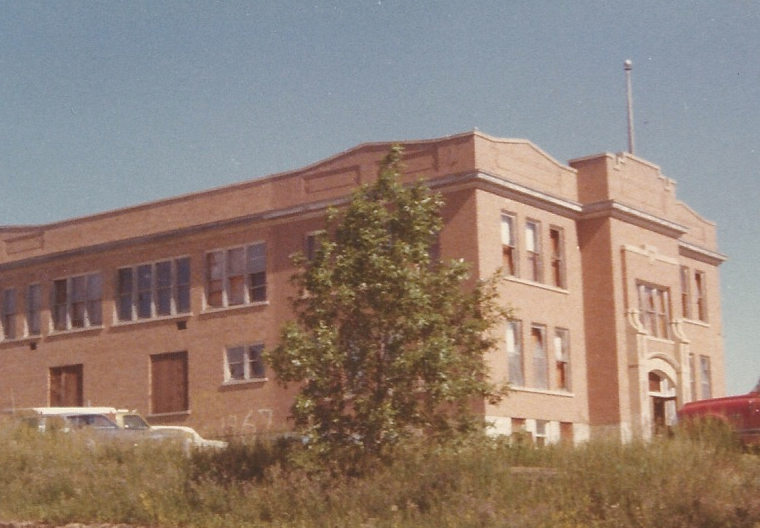 As you look at the brick building from the front, the 1st & 2nd grades were in the front lower left, 3rd & 4th in the lower right, then 5th & 6th upper right, and 7 & 8th upper left. All the rooms behind them were high school. All the Art Steinhaus sons graduated from this school. 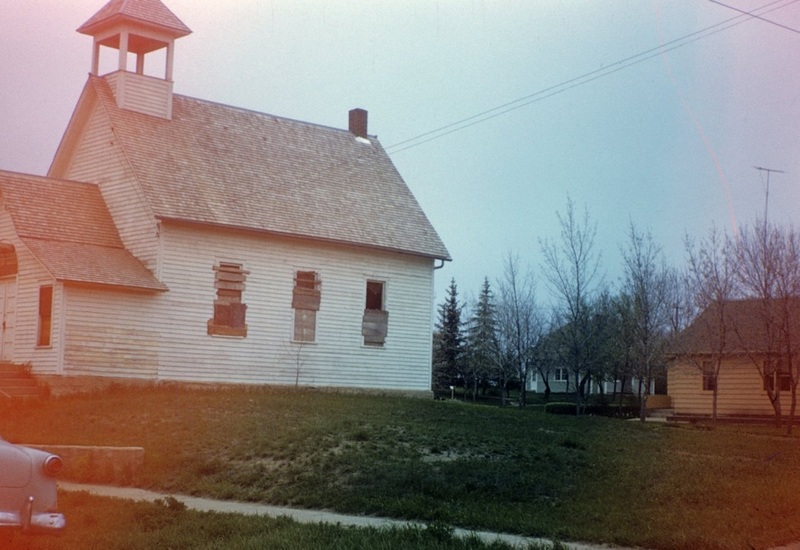 This photo was taken shortly before the building was demolished in 1978. It was last used by Boeing as assembly plant for minuteman missiles in the gymnasium. 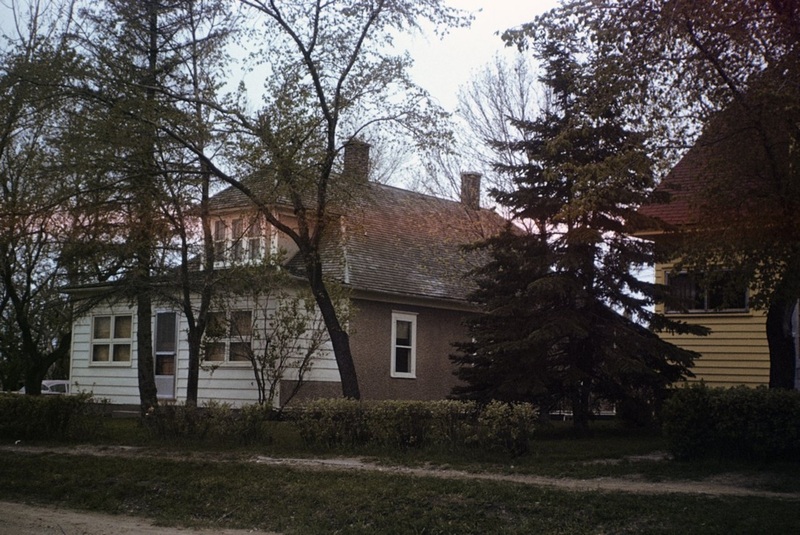 Art and Alice Steinhaus home in Max, completed in 1921. This photo taken in 1943 shows son Jim Steinhaus on a propeller-powered snow sled. 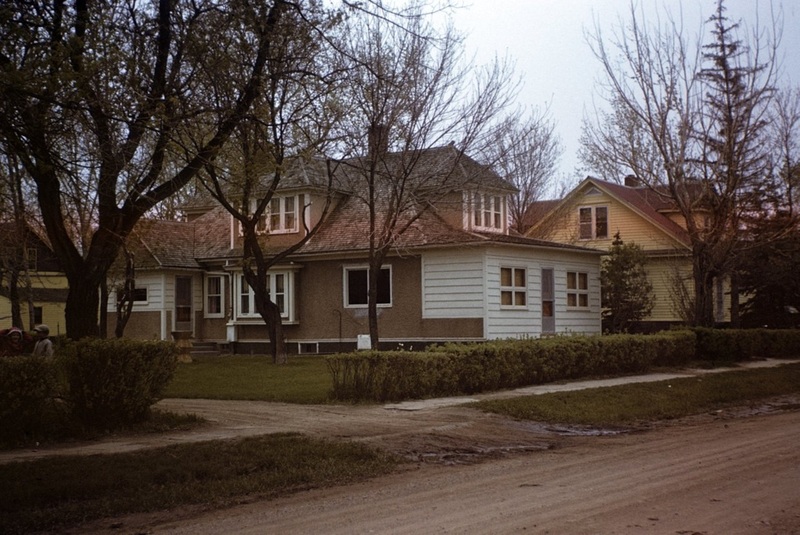 Steinhaus home in Max, about 1949, shortly before the family sold and moved to California. 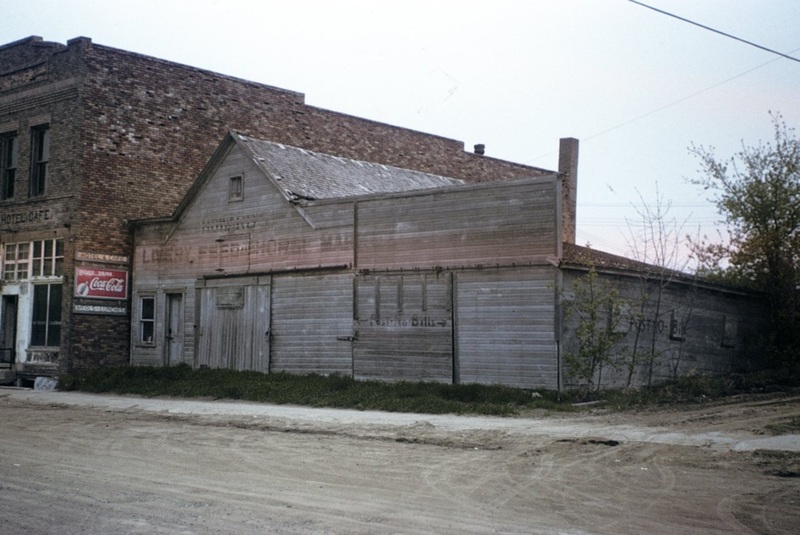 The New Hotel on Main Street, pictured here in 1962 by Ed Steinhaus, was built in 1916. According to Jim Steinhaus, "the hotel had a pool hall in the basement and about a dozen of the business men (including Gust, Art and Herman Steinhaus) would gather there to play cards in the late evenings practically every day. An interesting side note: Herman was walking home late after playing cards (June 1,1922) and interrupted a robbery of the First National Bank on Main Street. Was told by a robber in front of bank to hold up his hands.... Herman "couldn't get his hands up" and ran and jumped into a garbage can. The robber shot and Herman had a bullet hole in his derby which he showed to people the rest of his life." Looking at site of Steinhaus Bros store from across the street, 1962. 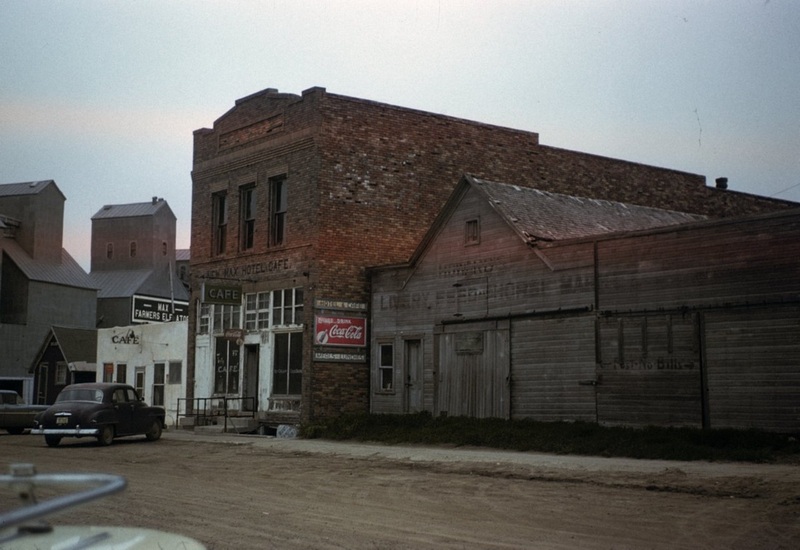 Livery Stable on Main Street, pictured in 1962 by Ed Steinhaus, that rented out horses and was the town transportation center before cars. Jim Steinhaus recalls, "cars started being sold in Max by Bostrom Bros (Paige Touring cars), and Steinhaus Bros (Dodges). 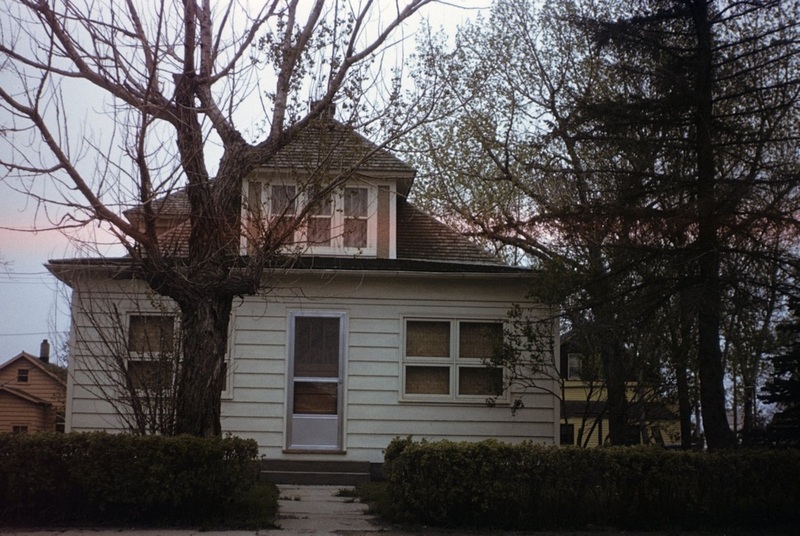 Old Steinhaus residence, 2009. Photo taken by Jim Steinhaus.